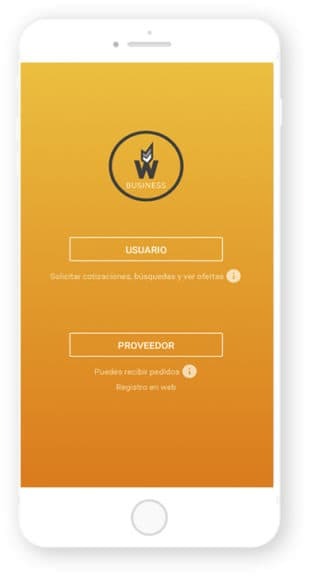 App that connects users and companies in an open space for the purchase and sale of products and services quickly and directly, without intermediaries. It is an open, quick and direct product buying and selling space, without intermediaries. We Find Business aims to meet the new mobile marketing trends by bringing them closer to all kind of companies and entrepreneurs, while generating an accessible showcase for all users in one single App. Quotation request: You can request a product or a service sorted by sector, country, amount, reference price and offer and delivery deadlines. Receive a notification once your application has been answered. Search for companies sorted by sector, country and top rated according to ratings given by users who have completed a transaction. Offers. Companies can also send offers directly to users. VIP Client. Exclusive offers for clients who hold a monthly or an annual subscription to the App. Once you have registered yourself and chosen a subscription mode, you can log in. Enter your offers directly from the web administrator. Order entry. If someone applies for your product or service you will receive a notification so you can complete the transaction. Order history. List of everything you marked as “I’m interested”.